The Codelocks CL460 and CL465 are mechanical access control locks specifically designed for use on internal and external narrow stile doors. These medium narrow stile locks come with a lever handle suitable for use on left or right hung doors in homes, nursaries, schools, warehouses, hospitals or leisure facilities. A single non sequential code allows the outside lever to be turned to unlatch the door. A key override is standard. 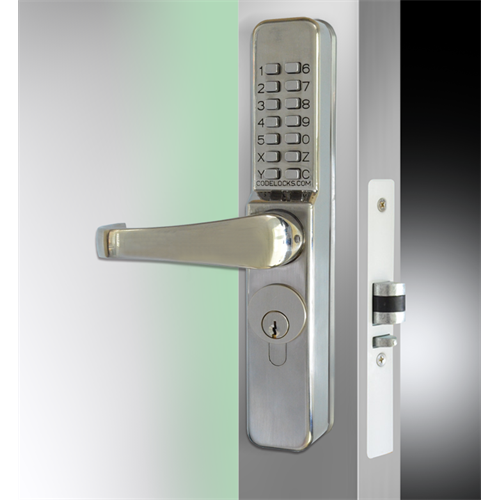 Locks are supplied with a random non sequential code that can be changed by the user while lock is removed from the door. Non sequential means that 1234 is the same as 4321 or 1342. CL460 has 13 buttons with 8191 different codes available. CL465 has 12 buttons plus a free entry button allowing for easy entry when needed.